Vancouver firefighters are taking precautions to reduce the risk of cancer caused by chemicals they encounter on the job by turning the hose on themselves. At the scene of a fire, first responders rope off an area for the cleaning process, which involves a hose, brush and soap. "We come out of a fire, we wash ourselves completely down with a hose from the outside, then you take all your gear off… and that goes to Number 1 Hall for a washing," Vancouver Fire Battalion Chief Mike Huntley explained of the process. The intent is to reduce firefighters' exposure to cancer-causing chemicals. The risk flames pose to firefighters' safety is obvious, but cancer is a very real danger for those called in when things go up in smoke. "It's much more insidious as well, because it takes so long for these diseases to develop," Vancouver Fire Capt. Jonathan Gormick said in an interview on CTV Morning Live Wednesday. "They're not obviously attributed to a single acute event but a career of exposures." Cancer is responsible for an estimated 50 fatalities per 100,000 firefighters, according to research co-authored by Surrey's fire chief. Gormick said some of the blame lies with soot and particulate matter, but the byproducts of combustion are also an issue. "Cancer-causing chemicals, benzenes, aromatics, all the very toxic things that are also carcinogenic that s oak into the fabrics of our equipment, that soak into our skin, that we breathe in if we're not wearing respiratory protection… Those cause long-term damage and eventually cancers," he said. While older buildings pose a risk of having asbestos, newer buildings made with synthetic materials are actually a bigger concern, Gormick explained. "Everything now is built with composites, plastics, petroleum-based products that have many more chemicals in them than legacy construction did," he said. While the resins, glues and other substances may be great for developers, when they burn, they emit toxins. Hosing down at the scene is a shift in procedure and mindset, Gormick said. When he first started his career 15 years ago, dirty gear was a symbol of pride for firefighters, but they soon realized it extended their exposure to soot and other substances. And cleaning off is one of several initiatives including a pilot project that saw the installation of infrared saunas in some fire halls so firefighters could try to sweat out the toxins. "It's pretty impactful to have spent even 15 years watching colleagues die from cancer," Gormick said, but he thinks the community is now much more aware that it is an issue and that steps need to be taken to reduce the risk. A study from the University of the Fraser Valley found firefighters are killed by cancer at a rate three times higher than the general population. The research published earlier this year also found firefighters were 86 per cent more likely to die from cancer than any other fatal illness or injury. 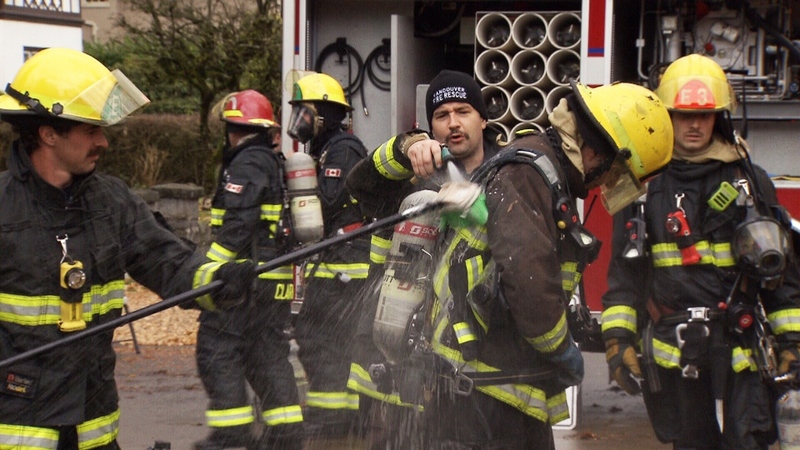 A Vancouver firefighter is hosed off at the scene of a fire.